The sound clip provided on this page is a Real Audio .rm file. This clip will play immediately, yet can only be heard if one has installed a RealAudio program, such as RealPlayer 7.0. To download a free copy refer to the link at the bottom of this page. On a cold Saturday morning, 19 December 1959, George Woods and Betty Greene have lugged their heavy tape-recorder from Croydon to London to record a seance with voice-medium Leslie Flint. He possesses a rare gift. Voices manifest at a point in space and are not spoken by himself. After a while the jolly boyish voice of his guide Mickey is being heard - first in a whisper but later loud and clear: Good morning! Betty Greene: May we know your name? 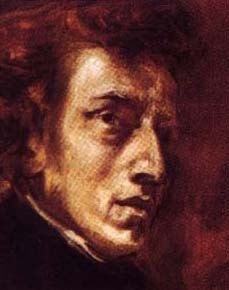 Voice: My name is Chopin, Frédérique Chopin. Chopin speaks in English. None of the participants understand French. A year before his death in 1849 he had visited England and Scotland. The late musical medium Rosemary Brown asserts to be in close contact with Chopin. He dictates new compositions to her. They have been recorded on a Philips long-playing record in the early seventies. This recording has been played for Rosemary Brown. She said to recognize the Slavonic-French accent. Mrs.Brown has also sat with Leslie Flint. Amongst the communicators, most composers, was Chopin. He spoke to her in direct voice in the same manner as when she was in telepathic contact with him at home. I only remember that I was very ill, lying on my bed. Some of my friends were with me and gradually everything seemed still. It was as if I was drifting away from everyting. And then I began to see an enormous light. At first it was a little tiny glimmer, then it became brighter and brighter...and I began to hear sounds. Music began to swell up and became louder and louder...it was as if there was a whole, whole orchestra. Magnificnet! True music, real music, great music, is something that is beyond your world, and springs from the spiritual aspect of man: the realization of the greatness and the oneness with God. Great music is something that is really born in the spirit and is reproduced, perhaps very badly, in your world. On the higher planes, on the very high evolved planes, we can create music without instruments, by the mere effort of thought. Thought being creative here, a great musicien can complete and achieve a whole work without an instrument at all! He can, as it were, create all the sounds from himself and, in consequence, those who are attuned in to his thoughts and himself - as it were - will hear the reproduction of that which the composer has created. Man in your world - though he has advanced in many ways tremendously - is still very ignorant of the power of the spirit. The ower that has been hidden within. It has been said to you: "Knock, and it will be opened unto you.". But few people bother to knock. They are content with that which has been given to them. There are many in your world who are very sincere, very kind, very good people......but they are very childish! (The bold-printed excerpt has been added as a sound-clip to this page. The voice of Chopin spoke for almost half an hour. The above are only a few excerpts. The late musical medium Rosemary Brown asserted to be in close contact with Chopin. He dictated new compositions to her. They have been recorded on a Philips long-playing record in the early seventies and she wrote an autobiography. This recording has been played for Mrs. Brown. She said to recognize the Slavonic-French accent. Mrs.Brown has also sat with Leslie Flint. Amongst the communicators, most composers, was Chopin. He spoke to her in direct voice in the same manner as when she was in telepathic contact with him at home. A play has been produced entitled 'Mrs. Brown. Muziek uit het hiernamaals.' (Music from the hereafter) in Holland in 2007 by Jacq Palinckx. Nocturne in A flat ( inspired by Chopin, 21 June 1966 ) played by Phillip Sear. Mr.Ohlson, a late friend of the sitters, looks back on his earthly life. Biographies of physical mediums, including Leslie Flint, in the past.